Research firm comScore today released a comprehensive report on mobile landscape in the United States and elsewhere and one particular chart stands out as another example of how the smartphone market is a duopoly between iOS and Android, with Apple and Samsung increasingly taking industry’s profits at the expense of – well, pretty much every other handset maker out there. comScore’s 2013 Mobile Future in Focus survey notes that the number of smartphone subscribers has increased 29 percent from a year ago and 99 percent from just two years ago. Google’s Android and Apple’s iOS now dominate the U.S. smartphone landscape and have guzzled an astounding 90 percent share. Apple continues to gain ground as the leading U.S. smartphone OEM, but Samsung has seen the most explosive growth in this market over the past couple of years with a year-over-year increase of more than 100 percent and a two-year increase of more than 400 percent. 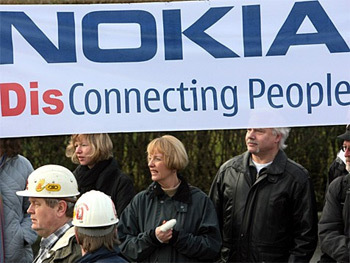 Meanwhile, the pressure is piling on other handset makers to turn profit. 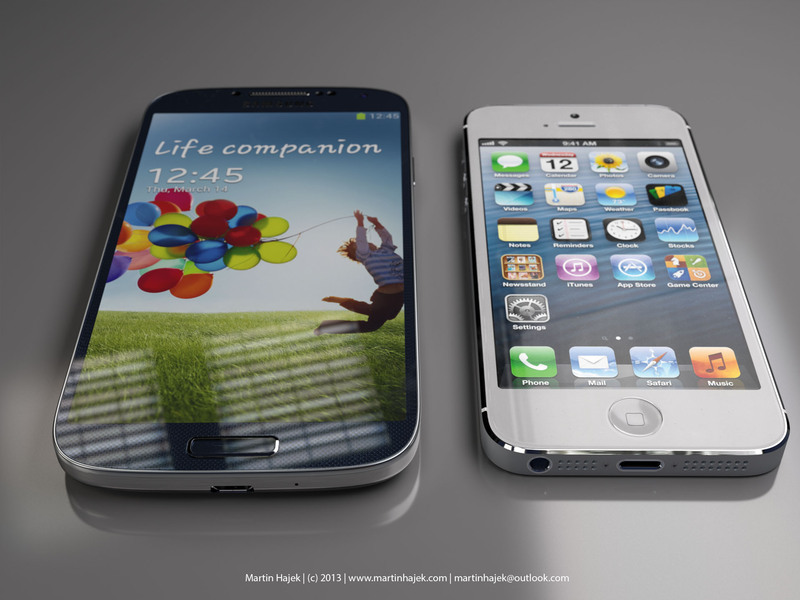 The Galaxy S4 vs iPhone 5 size comparison rendering by Martin Hajek. According to Bloomberg, HTC CEO Peter Chou said fighting Apple and Samsung in the U.S. isn’t his top priority. Developing a good brand is really hard. We come from a company with no experience, no resources for developing a global brand. We have to be friendly. We have great relationships. HTC is the world’s #4 smartphone maker, behind Samsung, Apple and Nokia. But as we’ve seen in the case of Apple, a strong brand (in addition to compelling products) goes a long way toward keeping customers happy. In the latest J.D. Power & Associates smartphone satisfaction metrics, Apple ranked first for the ninth consecutive study. 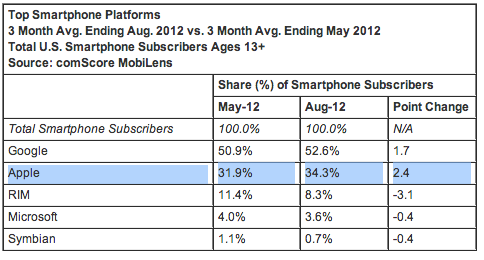 Market dynamics should also benefit the iPhone, especially the global trend toward smartphones. Indeed, an estimated one billion installed smartphone base is projected to grow to two billion smartphone users by year’s end as feature phone users upgrade to smartphones, per Strategy Analytics researchers. Smartphones in the United States have surpassed 125 million consumers and tablets are now owned by more than fifty million people in the country. The chart top of post nails it. 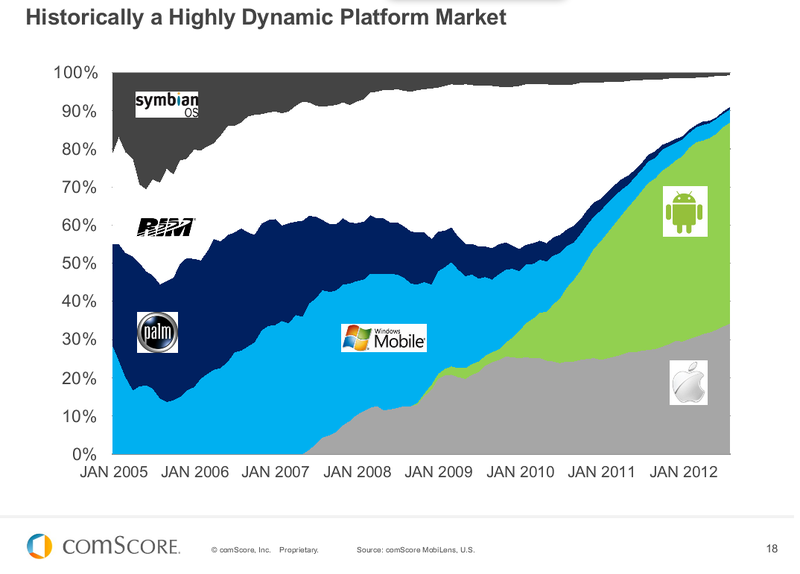 Not only does it highlight how the iPhone’s arrival in 2007 changed everything – see how slopes of the curve for BlackBerry, Windows, Plan and Symbian immediately dropped – but it tells the story of just how fierce and competitive the fast-paced mobile industry is today. As for Apple, don’t worry – I’m sure Tim Cook & Co. are quite happy with capturing most industry profits with a relatively low market share. That has got to be worth something, no?